Peace, God's Gift. Appreciate it. 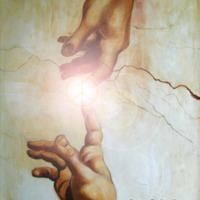 The piece is a re-purposing of Michelangelo's "The Creation of Adam" (1512), focusing on the touching of God's finger to Adam's creating a glowing peace symbol. Farhad Naderi, “Peace, God's Gift. 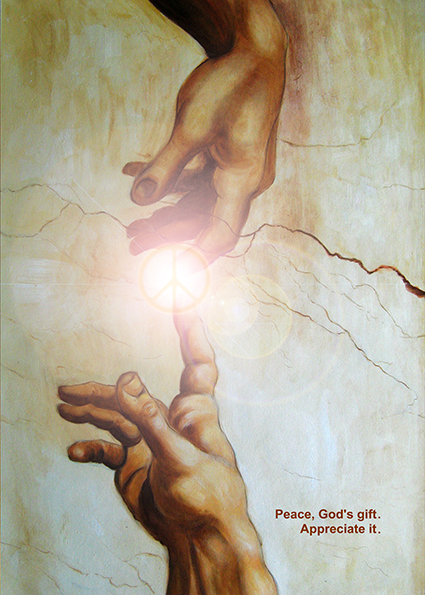 Appreciate it.,” Peace Posters Dialogue Project, accessed April 23, 2019, http://peaceposters.oberlincollegelibrary.org/items/show/345.